Hill acts to keep Gitmo’s inmates out of U.S. He has already missed his own self-imposed deadline, and President Obama’s plans to close the detention facility at Guantanamo Bay, Cuba, suffered more setbacks last week when lawmakers on both sides of the Capitol took steps to block him. On Friday the full House voted 282-131 to prevent Mr. Obama from transferring any of the detainees being held at Guantanamo to the United States, while the Senate Armed Services Committee passed a bill Thursday stopping Mr. Obama from buying a new prison to house the detainees. “We can’t stop every terrorist from coming to the United States but we can stop the ones that are coming from Guantanamo,” said Rep. Randy J. Forbes, the Virginia Republican who offered the amendment in the House that prohibits any detainee from being moved to the U.S. The administration has said it cannot close the facility until there is a prison in the U.S. that can handle the detainees – and that requires congressional approval to purchase a prison. The Justice Department has identified a prison in Illinois, known as the Thomson facility, that it wants to acquire and refurbish to handle detainees, who have have to be held under different conditions than regular prisoners. A White House official said Friday they are still pursuing the process. The House and Senate votes came on versions of the annual defense policy bill. The Senate version still must be voted on by the full Senate, and Armed Services Committee Chairman Carl Levin said he expects the ban on buying a prison to be re-fought on the Senate floor. Mr. Levin, Michigan Democrat, told reporters the committee adopted its ban by voice vote. The committee’s debate on the defense policy bill was closed to the public. The House, meanwhile, did not prevent purchase of a prison but did vote to ban the administration from retrofitting a building to make it suitable to house detainees – which amounts to a prohibition. But in adopting Republicans’ amendment to prevent transfers, the House went a step further. All but one Republican supported the transfer ban, while Democrats were split: 114 voted for it, and 130 voted against it. “There’s no difference between the Democrats and the Republicans when it comes to fighting terrorism,” said Rep. Ike Skelton, chairman of the House Armed Services Committee, who urged his colleagues to accept Republicans’ amendment. Attorney General Eric H. Holder Jr. told a Senate committee last month that the administration has identified 48 detainees who will need to be held indefinitely, in addition to those whom the government wants to put on trial in regular courts or military commissions. He said the administration needs Congress to pass funding to acquire the Thomson prison before the detainees can be moved from Guantanamo Bay. “We have to have an option, and that will require congressional support for the funding request we have made,” Mr. Holder said. Republicans’ amendment also requires an inspector general to determine whether defense lawyers for suspected terrorists have passed names of key military and intelligence figures to those accused of orchestrating the Sept. 11, 2001, attacks. Author AKA John GaltPosted on May 31, 2010 Categories 9/11, America, American Freedom, DOJ, Military, President of the U.S., Religion, War, War on TerrorTags Barack Obama, Eric Holder, Freedom, Freedom of Religion, gittmo, Government Lies, House Armed Services Committee, illegal immigration, Islamic Extremists, Muslim Extremists, POW's, terrorism, Violence, WarLeave a comment on Hill acts to keep Gitmo’s inmates out of U.S.
Memorial Day is a day of remembrance and respect for those who have given their lives for the freedoms that bless this nation. Most Americans no longer visit memorials and cemeteries; our nation’s wars do not touch them except for quick sound bites on the news. Fewer still actually know a service member or understand the sacrifices they make with their service, the time away from home and family, the inherent risks and the real possibility that they will sacrifice their lives. Since September 11, 2001, 5,456 American service members have perished fighting terror in all its forms. They all have family and friends who mourn their loss. They are the human face of this long conflict, and they will not be the last — the fight goes on, as it must. They were the best of us, and they deserve to be honored by the nation they fought to preserve. The Tactical Air Control Party site http://usaftacp.com/ has photos of Brad’s funeral and Tiffany and Chloe. Government Is Not the Answer, It Is The Problem! Author AKA John GaltPosted on May 31, 2010 Categories America, American Freedom, American History, Big Government, Goverment Idiots, Government Bail Outs, Government Corruption, Government Fraud, Government Schools, President of the U.S.Tags Freedom, government is the problem, not the answer, Reagan, We the PeopleLeave a comment on Government Is Not the Answer, It Is The Problem! Israel’s prime minister has expressed his support for the military’s actions in a deadly raid against an aid flotilla sailing to the blockaded Gaza Strip. Benjamin Netanyahu’s office says he spoke Monday to top Israeli diplomatic and security officials by telephone from Canada and voiced his “full backing” for the military. Commandos stormed six ships carrying hundreds of pro-Palestinian activists on an aid mission to the blockaded Gaza Strip, killing at least 10 people and wounding dozens after encountering unexpected resistance as the forces boarded the vessels. The operation in international waters off the Gaza coast was a nightmare scenario for Israel that looked certain to further damage its international standing, strain already tense relations with Turkey — the unofficial sponsor of the mission — and draw unwanted attention to Gaza’s plight. White House spokesman Bill Burton, speaking on the eve of a meeting that President Barack Obama had scheduled at the White House with Netanyahu, said the United States “deeply regrets the loss of life and injuries sustained” in the incident. Netanyahu announced Monday he would cancel his White House visit to deal with the crisis. Burton also said that administration officials are “currently working to understand the circumstances surrounding this tragedy.” The United States, among others, has been trying to restart direct peace talks between the Israelis and Palestinians, but progress toward this achievement has lagged severely in recent months. The tough Israeli response also drew condemnations from Turkey, France and the U.N.’s Mideast envoy, while Greece suspended a military exercise with Israel and postponed a visit by Israel’s air force chief. The U.N. Security Council announced they would meet Monday afternoon to discuss the attack. In response, Israel advised its citizens Monday to avoid travel to Turkey and instructed those already there to keep a low profile and avoid crowded downtown areas. The Israeli ambassadors in Sweden, Spain, Denmark and Greece were summoned for meetings, and the French foreign minister called for an investigation. Activists from all of those European countries were on board the flotilla. In neighboring Jordan, hundreds demonstrated in the capital Amman to protest the Israeli action and demand that their government breaks diplomatic relations with the Jewish state. There were conflicting accounts of what happened early Monday. “On board the ship we found weapons prepared in advance and used against our forces,” declared Israel’s deputy foreign minister, Danny Ayalon. Israeli security forces were on alert across the country. Palestinian President Mahmoud Abbas condemned the Israeli “aggression,” declared three days of mourning across the West Bank and called on the U.N. Security Council and Arab League to hold emergency sessions on the incident. The activists were headed to Gaza on a mission meant to draw attention to a 3-year-old Israeli blockade of the coastal territory. Israel imposed the blockade after Hamas, which it considers a terrorist group, violently seized the territory. Critics say the blockade has unfairly hurt Gaza’s 1.5 million people. “It’s disgusting that they have come on board and attacked civilians. We are civilians,” said Greta Berlin, a spokeswoman for the Free Gaza movement, which organized the flotilla. She spoke from the Mediterranean island of Cyprus and said she had lost contact with the flotilla. Before the ships set sail from waters off the east Mediterranean island of Cyprus on Sunday, Israel had urged the flotilla not to try to breach the blockade and offered to transfer the cargo to Gaza from an Israeli port, following a security inspection. 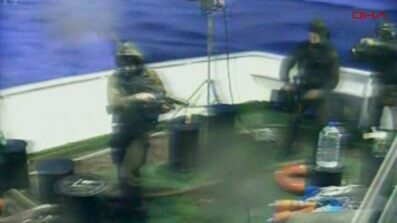 Israeli naval commandos stormed the ships in a predawn raid while they were in international waters after ordering them to stop about 80 miles from Gaza’s coast, according to activists. A Turkish website showed video of pandemonium on board one of the ships, with activists in orange life jackets running around as some tried to help an activist apparently unconscious on the deck. The site also showed video of an Israeli helicopter flying overhead and Israeli warships nearby. Turkey’s NTV showed activists beating one Israeli soldier with sticks as he rappelled from a helicopter onto one of the boats. The al-Jazeera satellite channel reported by telephone from the Turkish ship leading the flotilla that Israeli navy forces fired at the ship and boarded it, wounding the captain. “These savages are killing people here, please help,” a Turkish television reporter said. A total of five soldiers were wounded, two seriously, including at least one hit by live fire, the army said. Two of the dead activists had fired at soldiers with pistols, the army said. The violent takeover threatened to deal yet another blow to Israel’s international image, already tarnished by war crimes accusations in Gaza and its blockade of the impoverished Palestinian territory. It occurred a day before Prime Minister Benjamin Netanyahu was to meet with President Barack Obama at the White House to discuss the Middle East peace process. The ships were being towed to the Israeli port of Ashdod, and wounded were evacuated by helicopter to Israeli hospitals, officials said. One of the ships had reached port by midday. There were no details on the identities of the casualties, or on the conditions of some of the more prominent people on board, including 1976 Nobel Peace Prize laureate Mairead Corrigan Maguire of Northern Ireland, European legislators and Holocaust survivor Hedy Epstein, 85. Satellite phones on board the ships were turned off, and communication with a small group of reporters embedded with the Israeli military was blocked. The Free Gaza Movement is an international group of pro-Palestinian activists that claims the blockade, imposed three years ago after the militant Islamic Hamas group overran Gaza, is unjust and a violation of international law. Organizers included people affiliated with the International Solidarity Movement, a pro-Palestinian group that often sends international activists into battle zones, and the IHH, a Turkish aid group that Israel accuses of having terrorist links. Hasan Naiboglu, the Turkish maritime affairs undersecretary, told the Anatolia news agency that Israel had jammed communications with the ships. He accused Israel of violating international law by carrying out the raid in international waters. Turkey had unofficially supported the aid mission and has been vocally critical of Israeli military operations against Palestinians in Gaza. Israel’s Ynet news website said Israeli Defense Minister Ehud Barak called Turkish officials, including the defense and foreign ministers, to discuss the raid. The latest flotilla was the largest to date.